Architectural Windows & Entrys first designed our products for a home builder who lived on the waterfront in Newport Beach. The windows and doors originally installed over 30 + years ago are still in that home today and look brand new. We build a quality product and our craftsmanship is unmatched. We are known for our innovative products and often have received calls that start with “this person said if there is anyone that can do this it is your company”. If it can be done we will figure out how. We have an extensive background in builders’ hardware, glass and storefronts. We have represented major manufacturers over the years. Time and time again our clients would see our products sitting beside mass produced products and select ours. You will find our products in homes throughout Southern California, i.e. Laguna Beach, Newport Coast, Beverly Hills, Malibu, and Westlake Village. We have shipped units to Northern California, Las Vegas, Texas, Idaho, Arizona, Colorado and Hawaii as well. 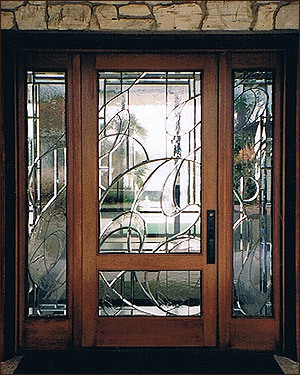 We have an in-house artist to help you with your Entry Door needs. 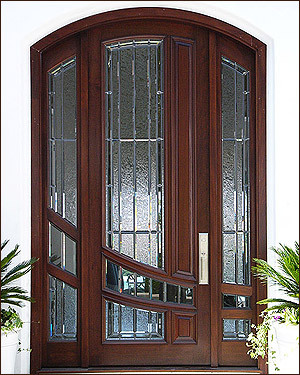 Entry Doors are designed to go with the architectural style of your home. We design for contemporary openings as well as traditional openings and everything in between. Single doors, double doors and units with sidelights and transoms are all built the same way. 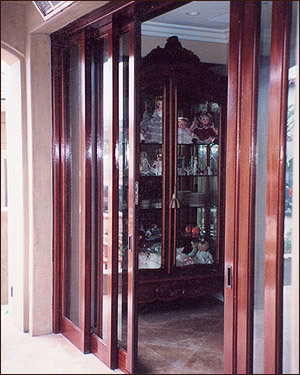 Oversize doors that take advantage of the height of an opening are one of our specialties. Doors for our entry units are typically built a minimum of 2¼” thick. Unlike a production line door that is only glued at the dowels, we glue the coping, dowels and complete joint leaving it in clamps until it is dry. It is important to note that no amount of paint will keep moisture out of a joint that is not glued properly. Any moisture getting in will cause joints to split ultimately ruining the door. 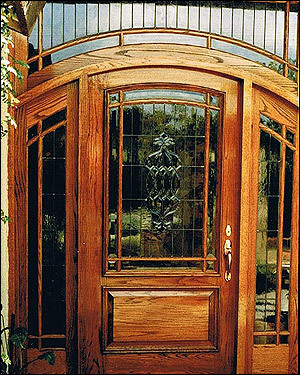 All of our doors, sidelights, transoms, gates and window sash are constructed, glued and clamped the same way. The species of wood used is left to your personal taste. It needs to hold up to any exposure the entry will receive. Mahogany, teak, walnut and oak are just a few of the possibilities. Our Entry door units are supplied with a complete pre-hung frame. Doors are pre-fit and weather-stripped and do not have door bottoms. There is nothing like the sound of your new entry door closing solidly against our exclusive concealed weather-stripping. We provide commercial grade, solid brass hinges to match your decorative hardware. An entry door unit will stand on its own as it creates the first impression of your home. There are many different configurations for our swinging French door units. We have solved the screening problem with our operable screened sidelights. 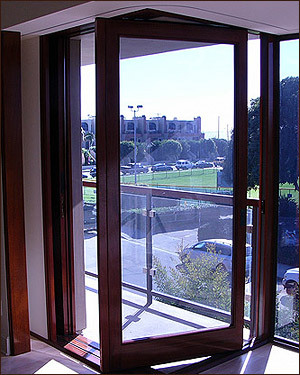 Our bi-fold door units are built 2¼” thick with a vertical style of 2½” to 3” wide. Since all doors are built for your individual project, we are able to add panels at the bottom or custom barring without significantly increasing the cost of the unit. Our bi-fold unit has a concealed top-hung track which protects it, as well as the hardware, from the elements. Depending on the system used, you can have individual doors weighing 160 to 275 pounds each. Our threshold system is built to be flush with your finished floor. You can continue your flooring to the exterior with our flush sill. The drain system is built-in to meet the individual needs of your project. We will build the threshold in wood or allow for your own stone flooring to be continued throughout. It has a 3/8” wide slot in the floor. We use a full length hinge on our bi-fold doors. This prevents sagging and eliminates daylight between the doors. It also provides extra weather-stripping protection. The result is a well functioning and beautiful product. We have a new bi-fold product that is built for egress and has wood screen doors. Ask us about our Brentley line. Our sliding doors are built the same as our bi-fold doors with concealed top-hung track, flush sill and drain, with floating guide system that compensates for irregular stone surfaces. Depending on the system used, you can have individual doors weighing 425 to 1000 pounds each. We want our product to look good with the doors closed as well as open, and with our concealed track and flush sill, we have accomplished our goal. Pockets for our sliding pocket door units are built complete with our units. You are not left to figure it out for yourself on the job. Our Customline deluxe casement window is a beautiful product. 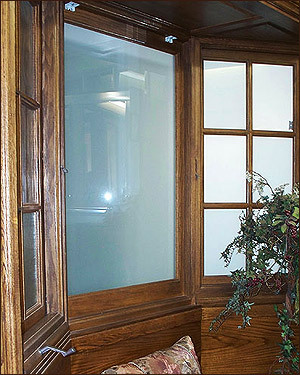 Our Customline unit has concealed hinges and recessed screens eliminating the unsightly dirt trap you will find in most casement and awning windows. You can remove and store the screens when they are not needed. The dual arm operators are under positive control and are a part of a “theft guard” system. The dual arm operation in combination with the cam-action lock, pulls the sash into the weather-stripped frame, sealing the window. With the clean look of our casement, it is referred to as “a piece of furniture”. Our deluxe awning window looks the same as our casement window, but opens from the bottom. This window is used when you have a horizontal opening. The wider jamb on our profile window creates an interior shelf and changes the profile of the exterior wall. The additional exterior trim greatly enhances the outside of your home. Our profile windows are available as sliding, casement, awning or fixed windows. Our bay and bow windows are an extension of our Customline deluxe casement window. Both feature the same hardware as our casement windows with a recessed screen and concealed hardware. They are built with a one unit construction eliminating unnecessary wood and allowing for more glass. A glass top bay window is available as well. We build our bay and bow windows with the head and seat board installed. The headboard can be built with additional panels. We build a storage seat (lift up or with a cabinet door front) or a full height opening. Our greenhouse window is built to the same exacting standards as our other window products. It has a glass top and allows you to have a large picture window at the front with casement windows on each side. This is a nice window to use when you have a smaller width opening. Our sliding window is built like our sliding door unit. It is top-hung allowing the sill to be flush. It has built-in drains where needed and can be made with a sliding pass-thru screen. If you want a completely open feel, this window can be made with pockets allowing the sash & screens to be stored until you want it closed.